31 Oct 2018 --- Global meat alternatives have moved far beyond the niche vegetarian and vegan domain to encompass a much broader base of flexitarians, as the quality improves to replicate real meat. According to data from Innova Market Insights, meat substitutes accounted for 11 percent of new meat product launches (meat, poultry and meat substitutes) reported in Europe in 2018 (Jan-Sep), up from 9 percent in 2013. The global picture shows stronger growth still, with 14 percent of meat launches in the first nine months of 2018 being meat alternatives. This compares with 6 percent in 2013. Plant-based meats were the key theme at SIAL 2018, where more innovative meat brands than ever were present, including brands such as Beyond Burger, Vivera, The Meatless Farm Co. and The Vegetarian Butcher. The meat hall at this year’s event was noteworthy for the sheer number of innovative meat alternatives on display to cater to both vegetarian and flexitarian consumers. and products remain juicy, even by using low percentages. For those who miss something in a vegetarian product, but still would like to reduce their meat consumption, Dutch company Meatless, has found a different way, which suggests mixing grains or legumes with meat. It may seem like a logical idea, but technically it is not as simple as it looks. To demonstrate their ability, the team from The Netherlands will demonstrate how it could be done, on stage during Food Matters Live at the London Excel next month (November 20-22). Meatless has worked for over a decade on solutions that blend meat and plant proteins. It has proved its concept in hundreds of successful products on the market in different countries. In London next month, the company will demonstrate that “meatless” in meat really matters. Technically Meatless products have a high water holding capacity and heat stability, which means that cooking yields are better and products remain juicy, even by using low percentages. 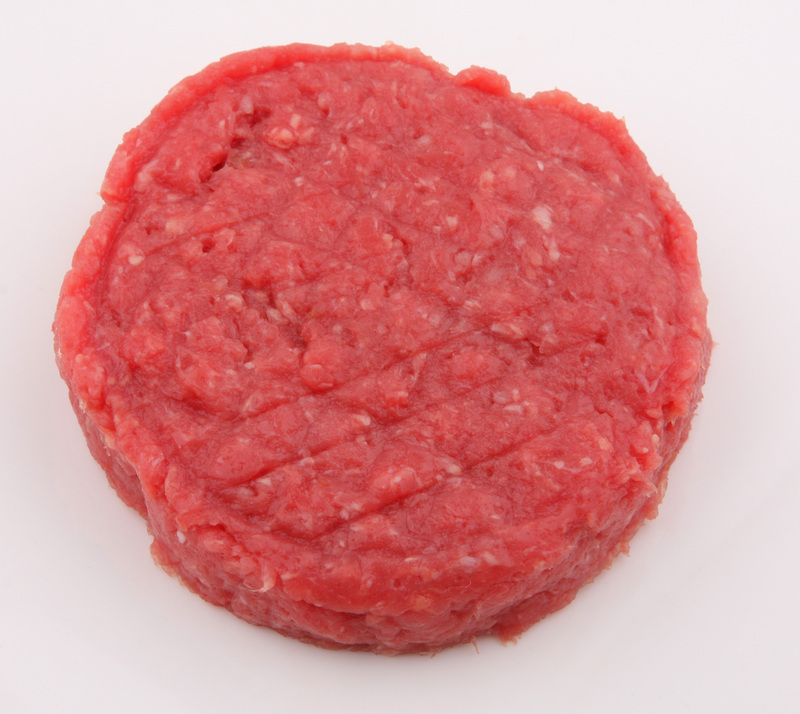 Especially in lean beef products, the use of Meatless improves taste and succulence, says the company. In London, a professional modern production line, provided by Verbufa, will be used to demonstrate how easily you could mix 50 percent plant-based ingredients into a tasty and low-fat hamburger. The food industry is searching for ways to reduce their footprint by using more plant-based raw materials in processed products for the vegetarian and vegan industries. Meatless plant-based products can also be widely used in processed meat and fish products. Meatless products are among the most efficient plant-based natural ingredients available on the market, having an extremely low footprint (land use, energy use, water use and GHG output), according to the company. big step towards more plant-based proteins in our diet. Making 50/50 so-called “hybrid” products could mean a big step towards more plant-based proteins in our diet, without noticing any difference. A category between meat and meat-free could substitute as much as 10-15 percent of all meat production, comparable to the position of surimi in fish. 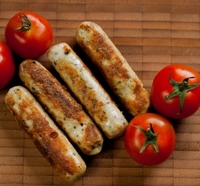 Meatless products can be used in any processed product, like chicken nuggets, sausages, meatballs or ready-made meals. Though vegetarian sales are growing healthily, a combination of plant- and meat-based proteins could boost a transition towards more plant-based protein in our diet in a big way, in addition to fully vegetarian options. “Meatless products have been on the market since 2006 and have been highly successful,” he continues. “From 2010, we had an average annual growth of 20 percent. Currently, our output is around two tons per hour. 50 percent of our sales go to the vegetarian and vegan industries to improve succulence and texture. 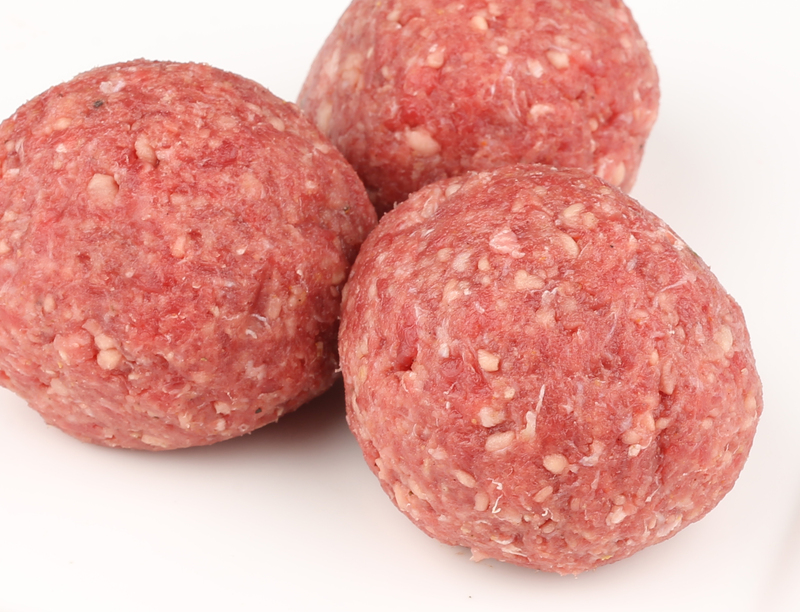 50 percent is used as a new generation extension product for processed meat and fish products, either to improve succulence, substitute meat or fat, or to control cost price. It's very effective as a fat replacer and probably one of the best options around to develop tasty lean meat products,” he notes. “We are strictly B2B, as well as retail and foodservice,” Hugense adds. This is not the first time that hybrid meat products have been suggested. Back in 2012, Vion launched Hackplus to the Dutch market. The product was dropped in the following year following disappointing repeat sales. 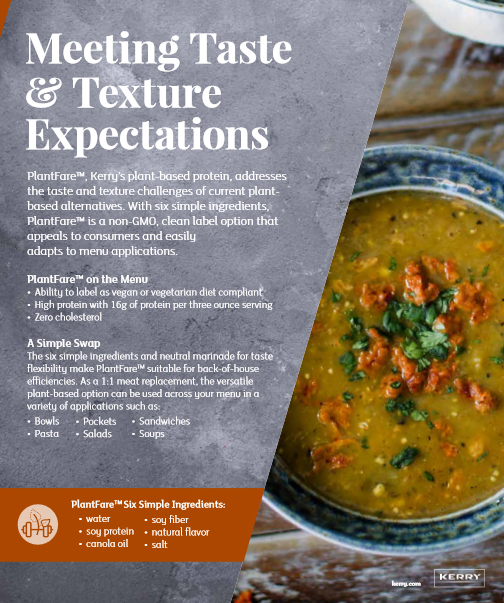 Meanwhile, Kerry, the Taste and Nutrition Company, has released “Rethinking Meatless,” a range of menu-inspiring concepts, which all feature plant-based protein, as well as insights on plant-based alternatives in the foodservice industry. Kerry answers the question of how chefs can creatively use plant-based proteins while maintaining the integrity of their menus and meeting consumer trends and demands. In their research, Kerry found that consumers were twice as likely to have tried meat alternatives at a restaurant – 41 percent of consumers surveyed had tasted it in a restaurant. As consumers try to explore the menu and experience plant-based alternatives that aren’t just a burger or a salad, chefs can find flexibility and creativity by using plant-based protein as a 1:1 replacement for meat. “Front-runners right now are soy and pea. The magic is in finding the intersection between the protein source, the bioavailability of the protein, processing simplicity, mouthfeel and functionality in the kitchen. No matter what the source is, it will need to be kept simple with a short ingredient statement,” he notes. “Protein is only important when the end product is a meat alternative. For example, jackfruit provides great texture, mouthfeel and appearance but its protein content is almost zero,” he adds. “Think about how versatile chicken is – that’s the goal. If you want to mimic steak, you’ll want something that looks and feels like a steak. But if you want to make a stir fry, pasta, a sandwich, tacos, etc., you’ll want a versatile protein that works in all of those applications,” explains Leahy. With the continuing rise of flexitarianism, some consumers want to replace meat with a one-for-one alternative. Therefore, the alternative should meet consumer expectations for texture and mouthfeel, he says. “The alternative should also perform as well as the meat that is being replaced in the recipe. The simpler, the better in the kitchen,” Leahy concludes.